Cadence, 2015. Oil on linen, 72 x 72 inches. Dialect, 2014. Oil on linen, 54 x 72 inches. Cadenza, 2015. Oil on linen, 84 x 63 inches. Cremona, 2014. Oil on canvas, 60 x 84 inches. Ostinato, 2014. Oil on linen, 78 x 78 inches. Consonant, 2014. Oil on linen, 48 x 48 inches. Barcarolle, 2014. Oil on linen, 54 x 90 inches. Oratorio, 2014. Oil on linen, 54 x 54 inches. Cassation, 2015. Oil on linen, 81 x 108 inches. Saraband, 2014. Oil on linen, 48 x 64 inches. Capriccio, 2014. Oil on linen, 78 x 78 inches. Fermata, 2014. Oil on linen, 64 x 48 inches. Untitled, 1983. Charcoal on paper, 22 x 22 inches. IX Machine for Living, 2008. Acrylic and watercolor on paper, 30 1/4 x 22 1/2 inches. Untitled (Study for Century), 1991. Colored pencil and ink on paper, 7 1/4 x 7 3/8 inches. Untitled, 2006. Gouache on paper, 18 x 18 inches. Untitled, 1993. Pigment and graphite powder on paper, 35 x 29 inches. Montrose, 1983. Gouache on paper, 12 5/8 x 15 1/2 inches. 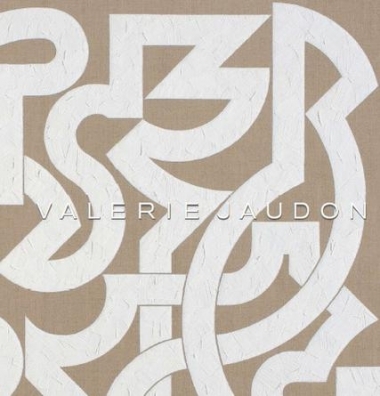 DC Moore Gallery is pleased to announce Valerie Jaudon’s forthcoming exhibition, Alignments, a selection of recent paintings in the main gallery paired with a concentrated 40-year overview of drawings and works on paper in the project room. Jaudon's paintings – all variants of black, white, and the color of the linen or canvas support – continue to explore the richly evocative arena of structural complexity, subtle reference, clarity of form, and restrained but lush brushwork. Her regularized linear forms, geometrically ordered yet crisply hand-painted, are set out in elaborately articulated continuous lines which wend their way across and through each painting. Jaudon's structural investigations yield single fields, both densely packed or airy and open with no overt mirroring, sets, or repetitions. Some resolve themselves into groupings of intertwined modules – clearly laid out but perceptually ambiguous. Her paintings are ongoing dialogues between the part and whole, the elusive and the stable, the abstracted and the resolutely material. Common to all of the paintings (and pointed to in many of their titles) is their sense of musicality. Contrapuntal, recursive, ornamented, and carefully dissonant, Jaudon's paintings invite contemplative analysis, invoking both the musical score and the experience of listening. Over the course of her career, Jaudon’s consistent voice has placed her in an especially vital position in the ongoing dialogue on contemporary American art. An original member of the Pattern and Decoration group, she is also closely aligned with the various manifestations of conceptualized abstraction, exemplifying those ongoing tendencies in Minimal and Postminimal art that made this particular way of thinking culturally and aesthetically relevant. The selection of works on paper on view, from 1973 to present, underscores the variety and consistency of her approach. Jaudon's work elucidates a grammar of abstraction that is identifiably hers – whether it be a monochrome painting, a richly colored one, an elaborate linear drawing, forms set on a washed field, or a large-scale public project executed in the widest possible range of materials – from tile and mosaics to pools, pavings, and gardens. Jaudon is the recipient of numerous awards and grants. Her work has been collected by and exhibited in major museums, among them are The Museum of Modern Art, New York; Whitney Museum of American Art, New York; Hirshhorn Museum and Sculpture Garden, Washington DC; National Gallery, Washington DC; Art Institute of Chicago, Chicago; Museum of Fine Arts, Boston; McNay Art Museum, San Antonio; St. Louis Art Museum, St. Louis; Albright-Knox Art Gallery, Buffalo; Städel Museum, Frankfurt, Germany; Louisiana Museum of Modern Art, Humlebaeck, Denmark; Suermondt-Ludwig Museum, Aachen, Germany.